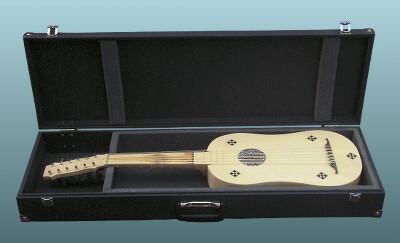 For most of the 16th century, the predominant plucked instrument across Europe was the lute. 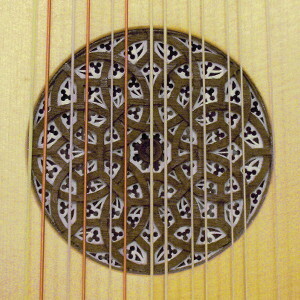 In Spain, however, equal prominence was given to the Vihuela. It is a delicate, 6-course instrument, with its own extensive repertoire. Since it is tuned similarly to a lute, all the 6-course lute repertoire is playable on it. 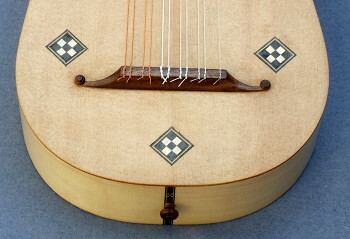 Aspiring lutenists should note that the vihuela is much easier to hold than the lute, especially when you're starting. Add a strap, and you can concentrate on learning technique instead of wondering how to stop the thing sliding round on your lap. I inherited my vihuela plans from an established luthier who retired some years ago. He did a thorough research and design job, resulting in an excellent and very playable instrument. The original string length was 680mm, but many players find this unmanageably long, so I have designed a 580mm version (similar to a 6-course lute) which has proved very popular. Materials - I normally use my preferred woods, which were all available in the 16th century. Body and neck in maple, with a spruce or cedar soundboard. Bridge, pegs, etc. are in walnut. Fingerboard is yew. This, of course, can all be modified to your specification. Normal stringing is GG cc ff aa dd g'g' but it also works well with a single top string and octaves on the fifth and sixth courses (gG c'c ff aa dd g'). All options include a decorative fingerboard and centre banding on the back. 7 courses - add £100 to the above prices. I know of no historical evidence for a 7-course vihuela, but it allows the extensive 7-course lute repertoire to be played, which is useful. A fancier rose, more inlay - tell me what you want and I'll work out a quote.